Many thanks to Jacqui for these thoughtful questions – and for permission to use them as a blog post. SPOILER ALERT: Although there are no major plot spoilers below, you may prefer not to read on if you’ve not yet read Lycopolis. 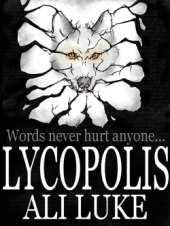 You can buy Lycopolis for the Kindle from Amazon.com ($2.99) or Amazon.co.uk (£1.97). 1. You dared to make the heroine, Kay imperfect, it was an unexpected twist, I would have found that very difficult to do as an author. It adds a depth and a mystery to her character that you can do a lot with later on. Did you intend that she should have a dark secret at the outset or did it happen as the story progressed? No, I had no intentions of the sort at the outset! In fact, it wasn’t until close to the final draft that Kay got landed with a secret – which meant going back and working hints about this in from the first scene onwards. I struggled in earlier drafts to give her character enough depth, and I felt she was originally too one-sided. My wonderful tutor, Francis Spufford, asked me why she was so good – and I felt this needed answering. 2. What came first, the concept that words are so powerful that they can become reality, the idea of writing about a demon or the experiences you are familiar with, (the game and your time at University)? I think they all came as a whole – I can’t remember quite how, and I wish I could break the process down. I definitely had the idea of the demon and the game (and the power of the imagination, by way of words) while I was an undergraduate – so around three years before I started Lycopolis. The one element which I consciously added was Kay and the experiences of university – but I always knew my protagonists would be in their late teens or early 20s. 3. How did you come to choose those particular experiences to write about? They were formative for me. I started playing an online text game when I was 16 – I’d had a difficult few years, socially, at school, and it was a relief to be part of a community where a certain geekiness and introversion was the norm! People appreciated my writing, too, which gave me more confidence. To a lesser extent, seeing how an online game operated as a business encouraged me to strike out into freelancing a little later in life. Cambridge was, of course, a fantastic experience – and very different from school. It also helped foster my love of words, and a lot of what I read during my time there fed into Lycopolis. And on a broader level, the themes about writing and the imagination come from my own love for words and for books, and my conviction of the power of story. 4. How do you paint such a vivid picture of a character like Seth whose behaviour you may not approve of? (How can an author write about someone he or she doesn’t want to address)? Seth was probably the hardest character to write – though also a lot of fun. I’m loath to admit it, but he’s definitely got some of my traits: he’s a perfectionist, he always has to be in control of things, he works for himself, and he’s forceful in pursuing his goals. I think it helped that I was very clear from the start that Seth wasn’t going to be an outright villain. He’s certainly not someone I’d want to meet, but he’s not irredeemable. As writers, we all have to tackle difficult issues – and that can definitely be uncomfortable. I suppose my advice is to imagine yourself in the head of the character: however unpleasant they might be, they’ll have justifications for how they behave. 5. Have you got the main plots of the other books worked out, or will it unfold as you write? I’ve got the core idea for Book #2 (though not a title, alas!) – plus the first few chapters mapped out. I’ve also got a sense of how the trilogy has to end. Beyond that, though, anything goes! 6. Did you research demons and effigies or did it all come from your head? I really liked the idea of using a person’s printed words to capture and encapsulate the essence of the person in a doll. I don’t do much research, because I find it a huge distraction from the writing. I’m sure the Prince of Nightmares was influenced by books/plays etc that I’ve read – Marlowe’s Doctor Faustus was one of the more conscious inspirations. The written word was such a huge part of Lycopolis that it seemed appropriate to use it for the dolls – I’m very glad that it worked for you. 7. You had a large support network around you when you wrote Lycopolis, the whole thing could have been the work of a more experienced writer, if you are producing this quality at your age, then readers have a lot to forward to. How important was that network and the course at Goldsmiths to you producing this work, could a writer without such a network and no formal training ever hope to come close to what you have achieved? Thank you! I’m blushing. 🙂 The Goldsmiths course was invaluable: when I look back now at the very first pages of the first draft of Lycopolis, it’s obvious how much I improved during my two years on the MA. One of the most useful parts of the course, though, was having a group of writers to workshop work-in-progress with – and that’s something that can be done outside an academic setting (and without paying hefty MA fees…) I’d certainly urge other writers to look for a local group to join and participate in, or even to find an online writing buddy. Beyond Goldsmiths, I’ve enjoyed workshops/lectures at the annual Winchester Writers’ Conference, and I’m a huge fan of Lorna Fergusson who runs writing workshops in Oxford (and who edited the whole of Draft 5 of Lycopolis). There are several excellent books about the craft of writing, too: my favourite for novel-writing is Nigel Watts’ Write a Novel and Get it Published (Amazon.com / Amazon.co.uk). 8. When can we expect the next book?